First published in 1910, this vintage book explores the various uses of dogs in war, in the police force, and in the home. As much an exposition on what a dog can do as what a dog cannot do, this handbook offers the reader a wealth of valuable information and it will be of significant utility to those with a practical interest in training dogs. 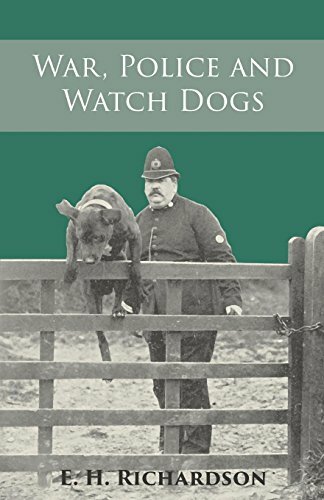 "War, Police and Watch Dogs" is also highly recommended for those wishing to train a guard dog, and it would make for a worthy addition to collections of allied literature. Contents include: "Dogs for Attack and Defence-Historical", "Dogs for Police Service as used Abroad", "The 'Executive' Dog", "The 'Criminal Tracking' Dog", "Breeds in use on the Continent", "Police-dogs for the United Kingdom", "The 'Executive' and the 'Criminal Tracking' Dog", "Reasons for Employing Dogs", "The English 'Executive' Dog", etc. Many vintage books such as this are becoming increasingly scarce and expensive. We are republishing this volume now in an affordable, modern, high-quality addition complete with the original text and artwork.